Enjoying an enviable location on the glamorous West Coast of Barbados, Calliaqua is one of the most sought-after luxury holiday villas for rent on the island. 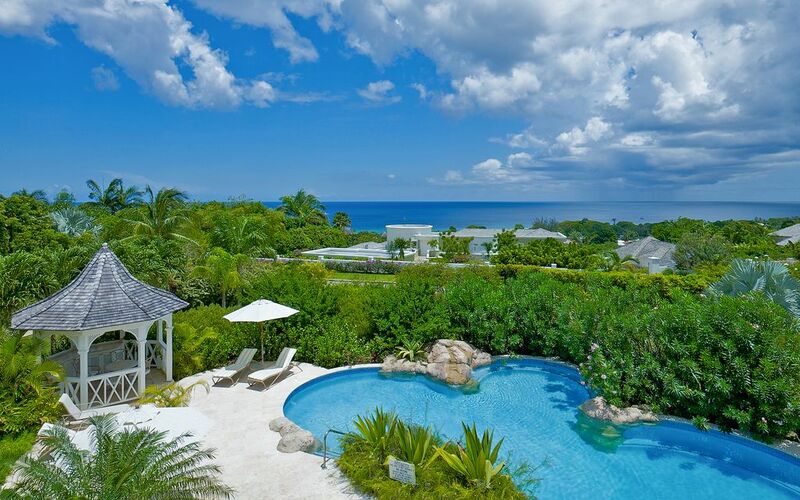 Occupying one of the finest positions on the exclusive Sugar Hill Resort, Calliaqua boasts glorious, uninterrupted views of the Caribbean Sea, cooling tropical breezes and an acre of lush tropical gardens, the perfect recipe for outdoor living. Its expansive terrace features comfortable wicker sofas and an impressive coral stone dining table, set beneath a crystal chandelier. The expansive lagoon pool features a gently babbling waterfall sheltered by hibiscus and brightly coloured bougainvillea. Sunset cocktails are enhanced by the sweet fragrances from the garden and the myriad lights dotted around, provide a magical evening atmosphere. Further relaxation can be provided by the extensive music system featuring indoor and outdoor speakers. Calliaqua caters comfortably for up to 10 guests with its four elegantly designed en-suite bedrooms and delightful one bedroom cottage. A stay at Calliaqua automatically provides membership at the nearby Fairmont Royal Pavilion Beach Club, ideally situated on one of the west coast’s most beautiful beaches and offering access to water sports, beach restaurants, as well as loungers, umbrellas and beach bar service. Use of the exclusive Fairmont Beach Club paired with Calliaqua’s lush and cooling hilltop location makes for an unbeatable Barbados combination. The Calliaqua package includes a full complement of staff, 5-star villa amenities and the many high-quality facilities at Sugar Hill, including gym, flood-lit tennis courts, on-site restaurant and bar and large infinity pool.